A former player of my campaign and good friend recently dabbled in running 5th edition, and reported back to me his impressions. One interesting thing that struck me was his dislike of the resting system. While I haven’t played enough 5e to know how it feels in play, I will say that a rest system to regain resources between encounters appears to be pretty common in new school games. Certainly Demon Wars also has it, in fact likely an even more generous form of it, allowing the players to regain all lost resources with 5 minutes of rest (though there are “wounds” which stick around and reduce max values of all resources and require days of rest to regain). This strikes me as evidence that new school games have a stronger focus on the pacing of a single encounter, possibly at the expense of or at least without regard to the pacing of a game-day, or delve into the dungeon, or adventure – whatever you want to call it. I think this is what makes me generalize that new school games are “combat focused” while old school games are “exploration focused”. This is perhaps not the best way to phrase my thoughts, because it can come across like I don’t like combat, and that’s totally not the case. I like combat, but I like combat in my games to be snappy. I want many combats in a single session, and I want them to be part of a greater whole that is for want of a better word, the exploration part – the bit where we consider the dungeon as a whole, rather than simply a container for encounters. The melee combat is designed to create natural climaxes around the 5th turn (give or take depending on the party and monsters); the magic system is therefore designed to tie into that by creating spectacular effects at around the same time – so a normal combat flow with no trickiness (use sparingly) has monsters out of balance and vulnerable at the exact moment when the biggest boom is coming. This really helped me come to terms with the way balance works for monsters, which is radically different from how it works for players for precisely the reasons mentioned above. I totally get it, and he’s right, it gives the combats this natural crescendo of action with exciting stuff happening at a predictable point in the fight. This is actually pretty darn cool, and as GM I find I can now hook design of specific encounters into that very concept. That said, what I really want is to have that same crescendo at a higher level of abstraction. I want to design dungeons where the party has a series of encounters that are increasingly dramatic, leading up to some kind of climax with the central element of the dungeon. For example, I want the players to have to fight some goblin patrols, and maybe a troll or two, before finally reaching the dragon’s den. I want players to wade through multiple fights with mindless undead before reaching the Necromancer’s lair. And I want players to take this into account when plotting their assault, to try and find ways to avoid the less consequential fights so they can bring the maximum fire power to bear in the final climax. With complete recovery between encounters, we lose that moment of “sweet, this is what I was saving the fireball for.” We lose tactics like mass invisibility or other stealth systems to infiltrate the enemy stronghold without alerting the guards. We gain more moments of high dramatic action where the combat turns on a good die roll, but we lose the preliminary set-up where the players create a cockamamie plan together that gives the context to why that die roll matters so much. Is it actually possible to architect crescendos in individual encounters without sacrificing adventure-level pacing? Does the latter require attrition mechanics in player abilities, thereby ruining our ability to foresee the pacing of an individual encounter? Honestly, I’m really not sure if there is a way to have our cake and eat it too. Related: I have a blog post coming up on natural healing through the ages. Executive summary: It was regularly, roughly doubled in each of the first six editions (OD&D, AD&D, B/X, 2E, 3E, 4E). 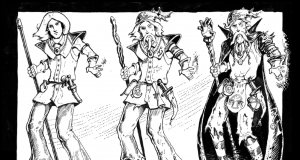 So 4E/5E-style recovery is about 100 times what it was in OD&D. Pretty much like a Warner Brother cartoon. Personally, I think this issue runs into serious complications vis-a-vis the central game-design question, “What behavior(s) do you want the game to encourage?” Your thesis, if I’m reading it right, is that attrition mechanics might be better for per-session drama, and non-attrition or “complete recovery” mechanics better for per-encounter drama. I don’t think that’s so clear, because on a behavioral level attrition mechanics don’t always shake out the way we think. On their face, attrition mechanics would *seem* to encourage the resource-hoarding that you associate with per-session drama — your example player holding back her fireball, encounter after encounter, hoping that she’ll get to throw it at the Big Bad. But the reality isn’t so simple, because of the asymmetry of information between the players and the DM and the overall nonlinearity of the reward mechanism. Players obviously don’t know how the session will go. A player wanting to engage in the resource-hoarding that the system seems to encourage therefore must assume she’ll actually get her chance to fireball the Big Bad. Yet sometimes she won’t. Sometimes the players never reach the Big Bad. Sometimes the Big Bad isn’t as Big as expected, and the fight is over in a blink. Whatever the reason, sometimes that player never gets to throw her fireball, and then she has to wrestle with the disappointment of having held back for no payoff, plus potentially the fact that the party had to slog through mooks she could’ve swept off the board if only she hadn’t been holding back. And so maybe next session she isn’t so keen on holding back. On the other hand, at least in my experience, non-attrition mechanics are in fact better at getting players to expend resources more liberally, leading to more dramatic encounters. Granted, every player has faced the unpredictable possibility of overspending within an encounter. Commit too much too soon, and when the suddenly dice turn against you, you have nothing left to save yourself, or your fellows. So there is often a predisposition to hang onto that last little bit of gas. But it’s easier to commit when you know might at least have *more than one shot* at a dramatic moment. That example player can throw her fireball at the mooks early in the session without feeling like she is cheating herself out of her one and only shot at a “boom” moment later. Maybe a better way of encouraging the same kinds of session-drama behaviors you’re associating with attrition mechanics — group stealth to get past the guards, etc. — is to consider the rewards instead of the costs. In many (most?) D&D-like systems, the players only get rewards (experience and treasure) for foes or other obstacles they actually encounter. That is a direct incentive for players to go hunting for every possible encounter they think they have a reasonable shot of surviving. But if there’s no reward for encountering the mooks, the goblin patrols, the mindless undead, then even in a non-attrition system there is an incentive to think and plan around them. Because each one of those encounters could, if the dice go badly enough, wipe out the party. That’s an improbable but unavoidable downside to an encounter with no upside. Nice, lots to unpack. Let me start with the simple fact that I suspect I rarely have a “thesis”, or at least don’t really land on it until I’m writing the final paragraph. 🙂 I know that can leave my blog posts a little rambly or stream of consciousness, but frankly that’s a big part of the draw of blogging for me. Writing down my thoughts forces me to martial them. Mostly this post started with the interesting discovery about resting mechanics and trying to figure out why we had a negative reaction to them. But yeah, I think your restatement of the thesis is probably accurate. Now I also think you’re dead on the money with the rewards. In both my D&D games, and in the Demon Wars game I’m now running, I don’t give rewards for killing monsters (or give very little), and the bulk of rewards come from gathering treasure. This does encourage players to find clever ways to raid a big treasure horde without necessarily fighting every enemy. But I do think you need both carrot and stick – in D&D my players know that random encounters waste their resources (health and spells) and have no reward (little if any treasure and thus XP), so are best avoided. In Demon Wars only the lack of reward disincentivizes the players from engaging in these fights, the waste of resources is not really present.